Home » Food and Nutrition » Should You Replace Your Daily Apple with Persimmons? Should You Replace Your Daily Apple with Persimmons? Have you heard the phrase, “An apple a day keeps the doctor away?” Well, according to a study from the American Chemical Society, there may be a different fruit that fends off your doctor even better than an apple—it may just be that a persimmon a day, not only keeps the doctor away, but it may also do more to reduce your risk of heart disease. An international group of researchers did a comparison of the two fruits and found that persimmons contained higher levels of dietary fiber, minerals, and phenolic compounds. Persimmons contain everything you need to fight the effects of atherosclerosis, a leading cause of heart disease, heart attack, and stroke. The study appeared in the February 2014 edition of the Journal of Agricultural and Food Chemistry. This is the first study of its kind looking at the health benefits of persimmons. Because of the compounds found in the fruit, it’s a good dietary choice for anyone with a family history of heart problems. Persimmons also contain higher levels of dietary fiber and antioxidants, along with significantly higher levels of sodium, potassium, magnesium, calcium, iron, and manganese. According to the study, eating one persimmon a day, along with other fruits and vegetables, is enough to fight the effects of heart disease. 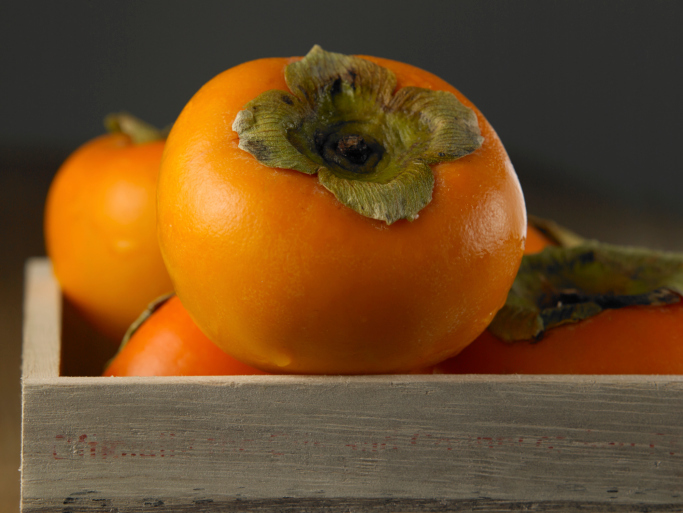 There are two types of persimmons available in your supermarket: Hachiya and Fuyu. Hachiya persimmons have an acorn-like shape, while Fuyu more closely resemble tomatoes. The fruit is typically available from September through to December. The best time to buy persimmons is during November, when the fruit is at its peak. Look for persimmons that are round and plump with glossy, smooth skin. If the fruits have cracked skin or blemishes, or the green leaves are missing, do not buy them. If you buy ripe persimmons, eat the fruit immediately, or, buy firmer fruits and allow them to ripen. To do this, place the fruit in a paper bag along with an apple or a banana. Once it’s ripe, store it in the refrigerator and eat it immediately. Overripe persimmons take on a mushy texture quickly. Persimmons can be enjoyed alone; sliced up like an apple is a popular choice. It also makes an excellent garnish for salads. Pureeing persimmons makes healthy sauces, smoothies, or milkshakes. The puree can also be used to make baked goods as well. Start your day out right by topping your hot or cold cereal, as well as pancakes, waffles, or French toast, with persimmons. The fruit can also be added to salsas. “A Persimmon a Day Could Be Better For Your Heart Than an Apple,” ScienceDaily web site, February 5, 2001; http://www.sciencedaily.com/releases/2001/02/010202073923.htm, last accessed July 18, 2014. “5 a Day: Fruit of the Month: Persimmons,” WebMD web site; http://www.webmd.com/food-recipes/fruit-month-persimmons, last accessed July 18, 2014.